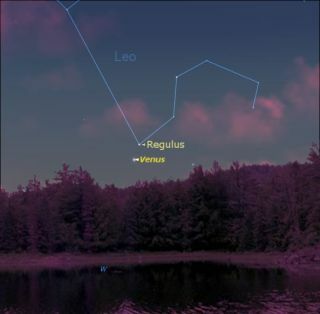 SKY MAP: Venus and Regulus as seen at 9:30 pm on July 13 from midnorthern latitudes. Venus hasbeen a prominent evening object since last winter. But it will finallyrelinquish the title of "Evening Star" in less than three weeks. Itsdeparture will be quite dramatic. Tonight,Venus is still fairly high up in the west-northwest sky at sunset and sets about100 minutes later. It is now also glowing at its greatest brilliance, blazingat an eye-popping magnitude of -4.5; more than 17-times brighter than Sirius,the brighteststar in the sky. On thisscale, smaller numbers represent brighter objects, and negative numbers arereserved for the brightest of all. On theevening of Friday the13th, Venus will pass 1.7-degrees below the bluish star Regulus, thebrightest star of Leo, the Lion. (For a comparison, the apparent width of the moonis roughly equal to one-half degree.) But poor Regulus is no match for Venus,as it will appear only 1/229 as bright, so you may actually need binoculars tosee this star against the twilight sky. On Monday,July 16, you'll see a crescent moon well to the right of Venus. And hoveringjust above and to the right of the moon on that same evening will be the planetSaturn. The next evening, the moon will have moved well away to the upper leftof Venus. Venus willbe setting about four to five minutes earlier each night, so it will bedropping noticeably lower and getting deeper into the glow of evening twilightduring the waning days of July. On July 26, Venus will be setting only about anhour after sundown and by the end of July, that will have diminished to only 45minutes; by then you'll need a clear and unobstructed horizon to spot it. A fewdays into August and it will be gone from our evening sky. That willmark the end of Act I for the 2007 Venus show. Then will come about athree-week "intermission," as it sweeps between the Earth and the Sun(inferior conjunction) on August 18. Then, justa week later it will begin to emerge into view as a morning object, rising inthe east about 45 minutes before sunrise. That will mark the beginning of ActII: By the end of August, Venus will be rising around 5:00 a.m. local daylighttime, and ultimately will become a brilliant predawn fixture in the eastern skyfor the balance of this year. During therest of this month, and again toward the end of August, Venus will appear asbeautiful crescent in telescopes and even steadily held 7-power binoculars. Thatcrescent will be getting progressively thinner during July, with theilluminated portion of Venus' disk diminishing from 26-percent on July 13th, toonly half of that by the 27th and less than 10-percent by month's end. Thatcrescent will also be getting progressively larger in apparent size as Venusapproaches the Earth. On the 13th, it will be 41 million miles (66 millionkilometers) away. But by Aug.1, that distance will have diminished by 11 million miles (18 millionkilometers) and the filament-like crescent will appear 27-percent larger. For those whohave been so accustomed (as I have) to seeing their brilliant friend greet themeach evening at sundown in the western sky, it might actually seem a little sadto finally see Venus finally go. But asAmerican writer, Richard Bach once wrote: "Don't be dismayed at goodbyes,a farewell is necessary before you can meet again and meeting again, aftermoments or lifetimes, is certain for those who are friends." And indeed,this will be only a temporary farewell to Venus; by the end of August herfriends can meet up with her again in the eastern sky before sunrise.